National Book Trust, India has created this privacy statement in order to demonstrate our firm commitment to privacy. The following discloses our information gathering and use practise for the National Book Trust, India website www.nbtindia.gov.in. At NBT, India we respect your right to privacy. The personal information share and exchange with NBT, India will not be shared, sold, disclosed, revealed to third party in any form, for any purposes, at any time. All contacts and sales information included the information/queries from us will remain confidential. 1. All sales are subject to availability of the books. 3. A uniform minimum discount of 10% available on all publications. 4. Order once confirmed and books sold shall not be cancelled. 1. Advance payment is necessary before confirmation of the order. 2. Payment options include Visa and Master Card only. 3. Payment once confirmed are not refundable. 1. 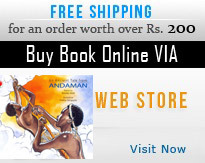 Shipping/delivery of books may be made by Indian Post. 2. The tarrif for shipping/delivery charges shall be paid while confirming the order. 3. For better delivery services the complete delivery address with telephone/mobile number should be mentioned in the order. 4. The delivery of books may be ensured within 10 working days subject to any unforeseen events which is beyond the control of NBT, India and Indian Post Govt. of India. Post/Government of India are available. 1. No return/refund of the confirmed orders. 2. Replacement of damaged/incomplete books supplied may be made with free postal charges. In case of any dispute/legal claim the matter may be settled under the jurisdictions of Delhi High Court only. Through there are sufficient safe guards maintained on online sale but for any technical error beyond the control of service provider shall not become a ground for any legal dispute or claim.